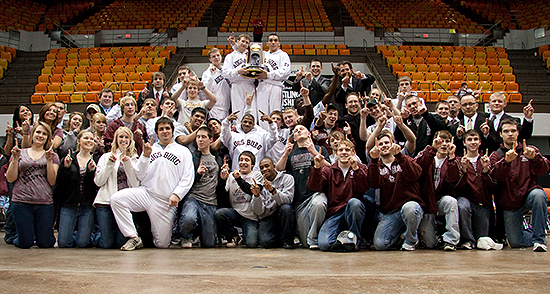 Today’s fea­tured pho­tos is from the end of the 2010 NCAA Div. III Wrestling Na­tion­al Cham­pi­onships in Cedar Rapids, Iowa on March 6, 2010 show­ing the Augs­burg wrestling team, it’s coach­es and stu­dent man­agers. Today’s pho­to is the first in a se­ries from the 2010 NCAA Div. 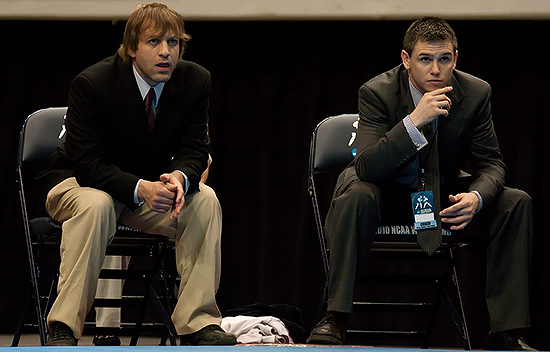 III Wrestling Na­tion­al Cham­pi­onships in Cedar Rapids, Iowa on March 5 and 6, 2010. I was hired by Augs­burg Col­lege, Con­cor­dia Moor­head and St. Olaf Col­lege to shoot the event. Here is the Augs­burg team lined up be­fore the night ses­sion of Day 1. 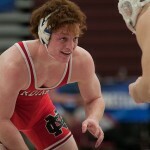 The Augs­burg Col­lege Wrestling team lis­tens to the Na­tion­al An­them be­fore Ses­sion II of the NCAA Div. 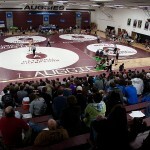 III Wrestling Na­tion­al Cham­pi­onships in Cedar Rapids, Iowa on March 5, 2010. Augs­burg won their 11th team ti­tle the next day. From left to right: Andy Witzel, Jared Massey, Zach Moli­tor, Or­lan­do Ponce, Ja­son Adams, Tony Valek and Paul Bjork­strand. Not pic­tured: Josh Roberts, Mark Matzek. Un­like most the the pho­tos I post here, I have edit­ed this one quite a bit with the burn and dodge brush­es, so no ed­i­to­r­i­al uses of this pho­to. Of course, I still have the RAW file. I did no­tice that the flag has been over­burned — es­pe­cial­ly in the web sized file — but that can be worked around, or bet­ter yet, the edit­ing can be re­done. Canon 30D + 17–85mm f/4–5.6 IS. f/40 at f/5.6. ISO 1600. 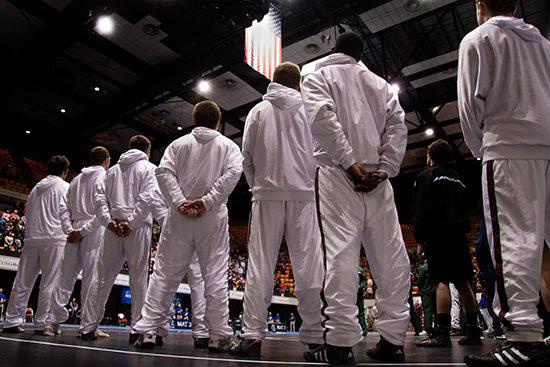 Here are some im­ages from the 2010 NCAA Great Lakes Re­gion­al for Div. III wrestling. All im­ages shot with Canon 30D + Sig­ma 70–200mm or Canon 17–85mm IS. More in­for­ma­tion the tour­na­ment is avail­able on the Augs­burg Ath­let­ics site.